As some of you guys might know, I recently did some serious damage to the bottom end of my M20. It seems to have been related to oil pressure, or maybe even starvation. I don't plan on trying to figure it out any further until I actually have the motor out of the car. I decided this was as good of a time as any to upgrade to a better platform. Enter the M5x series of motors. I don't believe the S50 or S52 motors provide enough extra performance to justify the "///M tax" I've experienced locally. All the S50/52 motors I've seen locally have been priced $2000-4000, which just seems crazy. I originally looked for an M52B28, but I wasn't able to find one in any kind of reasonable condition. I wound up finding a M50TUB25 with some extra goodies for a pretty good price, so I went for it. Sure, it's older and has less displacement than the M52B28, but it still has VANOS. That has to count for something, right...? I also have 2 ECUs. One is a silver-label 413, and another is a red-label with eBay and Stock chips. Supposedly the eBay chip actually works - 7000rpm limit, EWS delete, etc. I don't think I will need it though, once I step up to some kind of turbo-ready EMS. Same engine I am running as well. Mine has held up pretty well to the abuse I deal it. LOL! If you want the add a few "m" goodies to it, you could s50 cams and s52 injectors for a little more oomph. That's what I am I running and will eventually get the Turner chip to optimize the setup. Hopefully everything goes well for you! ten2doyle102 wrote: Same engine I am running as well. Mine has held up pretty well to the abuse I deal it. LOL! If you want the add a few "m" goodies to it, you could s50 cams and s52 injectors for a little more oomph. That's what I am I running and will eventually get the Turner chip to optimize the setup. Thanks for the good wishes. This will get the vroom-psh treatment and maybe some S50 cams, if I can find an affordable set. Reliable 300-350whp is the goal. Sounds like a great plan! You'll be able to add another link to your sig, lol. jeeze, Sometimes I feel like I've got the last M20 powered E30 on the planet. Lol tony! I would have stayed with an m42 or m20, but this m50 came cheap!!! You probably got it for a lot less than you can get a M42 for these days, all the 02 projects are taking em! I feel like more people cling to the M42 than the M20 lol. Old tech tony! It was a matter of availability for me. I have always thought dropping in an M30 and building a period-correct 911 fighter would be cool. In like 20 year my m20 will be worth billions. M20_fever wrote: In like 20 year my m20 will be worth billions. M20_fever wrote: jeeze, Sometimes I feel like I've got the last M20 powered E30 on the planet. 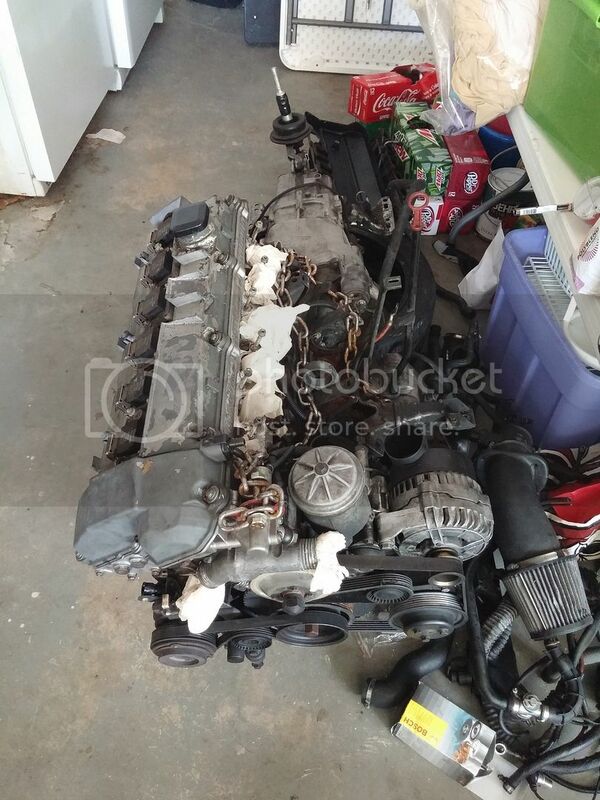 Hey, 3 out of my 4 e30's are m20 powered! At least until I can find a cheap LS1 and take the m20b27 out of the black 87 2 door. I'd considered a E30 Touring with a M30 but I think I'll be getting a Euro E28. I need something to boost though.... What kind of plans do you have to rebuild the engine? New seals and studs along with some cams maybe? Ryki wrote: I'd considered a E30 Touring with a M30 but I think I'll be getting a Euro E28. I need something to boost though.... What kind of plans do you have to rebuild the engine? New seals and studs along with some cams maybe? I'm hoping to do most of the exterior seals on the engine. I would also like to check the rod/main bearings for any abnormal/excessive wear. The VANOS is supposedly good, and that's easy enough to work on once the car is up and running. I'm looking at either having the head/block refinished for a thicker-than-stock MLS gasket, but I'm leaning towards o-ringing the block to run an OEM gasket and keep the high compression ratio. I'm leaning towards a low-boost, fast spool setup, and keeping the compression ratio will allow me to reach my goals at lower boost levels and improve things outside of boost. From what I've read, 10 PSI is the absolute limit for a stock motor. I believe that should be achievable with ARPs and o-rings. I'll definitely be using ARPs to hold the head down.